Treat night in veganuary can be tricky, but these crunchy tofu ‘Chicken’ bites are not - a quick coating mix and 5 minutes in the frying pan is all it takes for a delicious Friday night snack. Perfect for dipping in Hellmann’s Vegan Mayo, seasoned with a little cajun spice. 1 Place the plain flour in a mixing bowl, add the water and whisk to a smooth batter. In another bowl, mix the polenta, rice flour and 1 tsp of cajun spice mix until evenly combined. Dip the tofu chunks in the batter followed by the polenta mix ensuring each chunk is evenly coated. 2 Pour the vegetable oil into a deep frying pan or skillet and heat the oil to 170c. Carefully lower each of the tofu chunks into the oil and fry for 4 minutes, turning occasionally, until golden and crispy. Remove the chunks from the oil and place onto kitchen towel to drain. 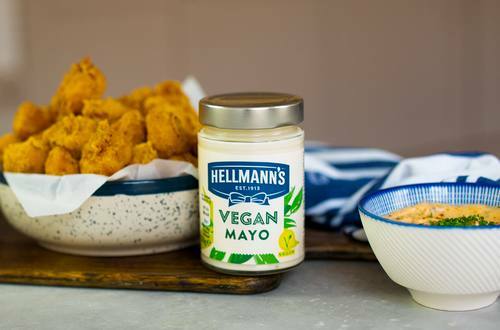 3 Place the Hellmann’s Vegan Mayo, chives and the remaining cajun spice into a bowl and mix well to combine. 4 Season the tofu chunks with sea salt and serve alongside the dip.